http://64.12.61.6/stream/1022 times out for me in VLC. And the DeepHouse stream works fine for me in 1.10.2. Make sure the decoders unpacked properly you should have "mp3spi-1.9.5-1.jar" and "vorbisspi-1.0.3-1.jar" in your mods directory. Also what OS, and which Java Version are you on? I'm also On Windows 10, Java 8, did you verify the decoders were unpacked? i had them in the main mod installation folder. if they needed more work then that then i'm afraid i didn't do more then that. Hi the mod is great but do you think you could remove 10 speaker limit or put it in config? 1.7.10 is the only version with CC support, and someone said it was broken so I'll have to look into it again. Removing the 10 speaker limit... it was done for performance each tick ALL of the speakers attached to a radio are scanned, so more speakers means more time scanning speakers. I might move it to a config entry but it WILL cause performance issues. This was just implemented in the latest builds, as I said though, setting this too high WILL cause performance issues. 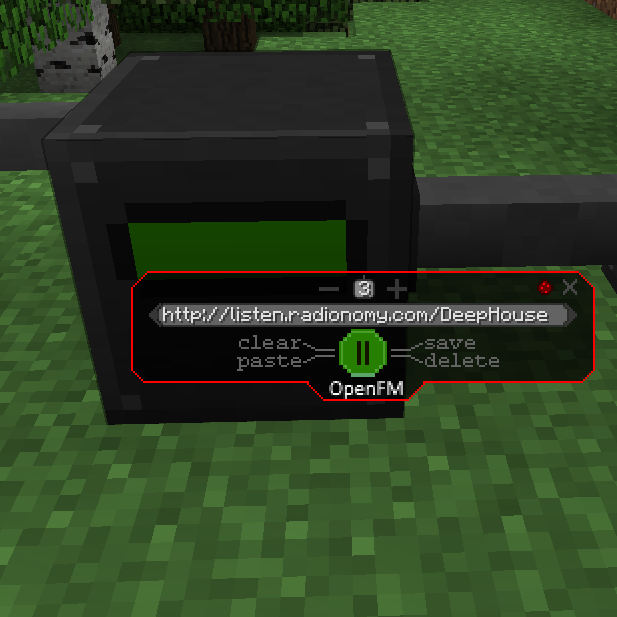 Im using version 1.9.4-0.1.0.10 of the mod and version 12.18.1.2026 of forge, the radio isnt harvestable by any vanilla tool, could this bug be fixed in the next release? See if the newest build possibly fixes it for you please. So, it does drop properly now? Thank you so much for porting it to newer versions! Is there any ETA on 1.10.2 release or does the 1.9.4 mod version work just fine with it? It should work fine on 1.10.2, there is at least 1 user on that version using it. Just tried it for 1.10.2 and works fine.